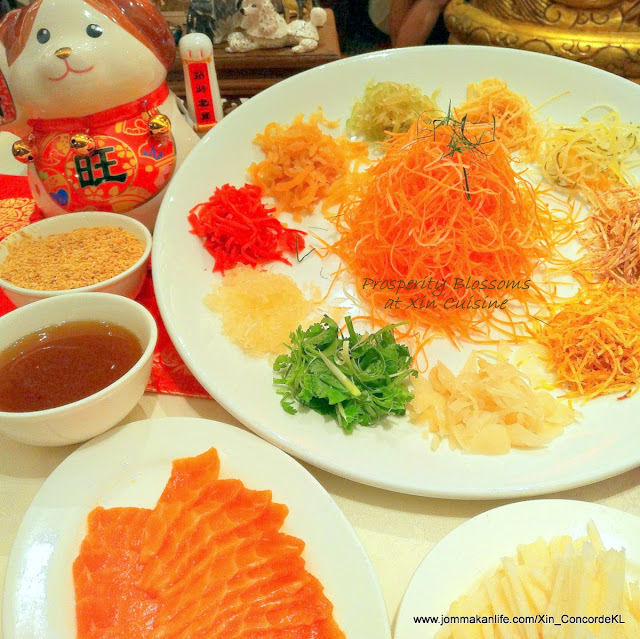 Tradition rules the three Prosperity Set Menus at Xin Cuisine this Chinese New Year with cherished festive specialities topping the list. Priced at RM1,388 nett, RM1,688 nett and RM2,188 nett per table of 10 persons, the CNY celebratory set menus will be available until 2 March 2018. Six varieties of the colourful raw fish salad will be available including Norwegian Salmon, Soft Shell Crab, Jellyfish, Baby Octopus and Snow Pear. Priced from RM80 upwards for a regular portion, the large portion costs up to RM198. We made merry with the perennial fave of Norwegian Salmon Yee Sang with an additional serving of Snow Pear (top up at RM10). As expected, the freshly shredded ingredients with assorted pickles, crisps and shredded snow pear - once stirred and tossed thoroughly - made for a great starter. Double-boiled Chicken Soup with Dried Scallop, Wolfberries and Chinese Herbs. The clear broth was mildly herbal on the palate, tinged with faint bittersweet notes. A salubrious soup to relish, to boost one's stamina for the anticipated festivities this CNY. Roasts are one of Xin Cuisine's signature delicacies hence the inclusion of Crispy Roast Duck with Chinese Herbs into this year's celebratory menus. From our first-hand sampling, the meaty offering ticked all the right boxes -- from the aromatic crispy skin with a whiff of herbal woodiness to the juicy, delicately gamey meat -- the dish was on-point. Layers of varying texture piqued our interest when we waded in to savour the Steamed Dragon Tiger Garoupa with Fresh Black Fungus & Beancurd Sheets. Known as loong fu parn, this fleshy hybrid fish proved notable for its inherent sweetness; a nice, rich canvas offset by the slight crunchiness of fresh black fungus and slippery skeins of beancurd sheet. Delicious! Unpolished brown rice lent a healthier twist to the tasty pot of lap mei farn - Stewed Chinese Sausage with Two Varieties of Rice. We couldn't get enough of the subtly boozy nuance in the waxed sausages which were imported from Hong Kong. Diners can order the Waxed Meat Rice in Claypot separately too along with different preparations using the waxed specialities. Should you prefer a simpler meal, the indulgent Bountiful Fortune Pot (RM388 regular, RM688 large) may fit the bill. Laden with premium goodies, ranging from abalone and dried oysters to roast pork and mushrooms, the substantial pot is an 'all in one' feast. Although we half wished dessert could be more exciting, the Chilled Peach Resin with White Fungus & Red Dates came up to mark. Ideal for soothing parched throats and light enough to leave you walking away from the dinner table guilt-free. A hit among Xin regulars, the Nian Gao Specials (RM13 per serving) have always been much anticipated every time CNY comes around. This year, the creations comprise Fresh Shredded Coconut Nian Gao, Sesame Rice Ball Nian Gao and Peanut Nian Gao. Our preference slanted towards the fail-safe shredded coconut coated sticky glutinous rice cake but the sesame seed-coated balls of mochi meets nian gao weren't shabby either. Instead of the same old CNY hampers, Xin Cuisine has launched a new series of their winsome CNY New Year Gift Boxes at RM138 nett each. Backlit with soft LED lights, the four distinctive designs feature a sprig of cherry blossoms, a trio of gold fish, a pearl on a lotus leaf and a Chinese pipa/lute. Beautifully embellished with crystals, the elegant boxes come with USB port and cable can be filled with a choice of glutinous rice cake or a quartet of pineapple tart, salted egg pastry, yam pastry and red bean pastry. They make fabulous gifts in conjunction with the CNY when you visit relatives and friends. Currently, the promotional price is RM118 nett per box and is sold at the CNY kiosk of Concorde Hotel Kuala Lumpur daily from 10am to 9pm. For more information, call the CNY Gift Kiosk, tel: 012-399 5436 (direct line) or 03-2149 2799 (office hours). Reservations for CNY dining at Xin Cuisine can be made by calling tel: 03 2144 8750. Address: Lobby Level, Concorde Hotel KL, Jalan Sultan Ismail, KL.